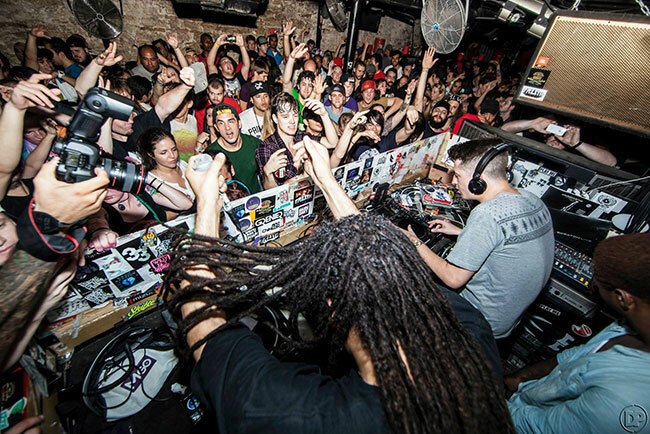 Austin has gained a reputation as one of the best havens for artists and creators in the US. If you love music, the tech scene, independant film, and all kinds of food, you probably won’t regret moving to Austin. Austin is one of the fastest growing cities in the country which comes as both a blessing and a curse. Fortunately, we’re here to help you not stick out as an Austin newbie. Our guide will give you the essential groundwork you’ll need to get you on your way to being a full-blown Austinite. 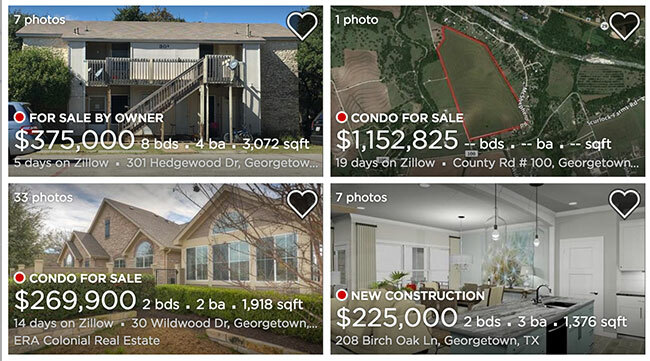 Which Austin neighborhoods are most affordable? 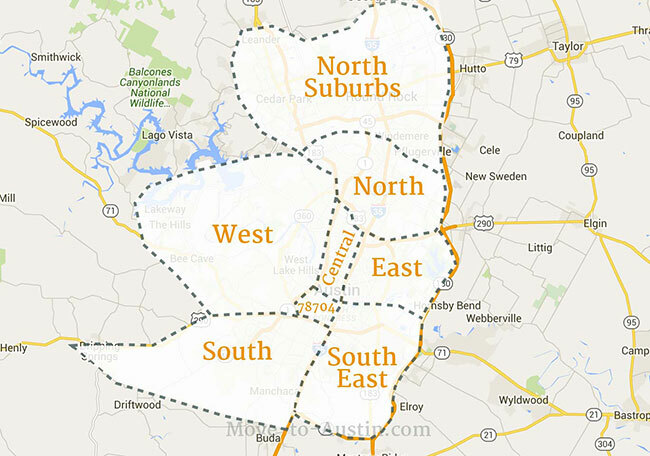 Which neighborhood in Austin is the best fit for me? How long is the commute in Austin? How’s the walkability, bikeability, and public transportation in Austin? Where can I find apartments and houses in Austin? 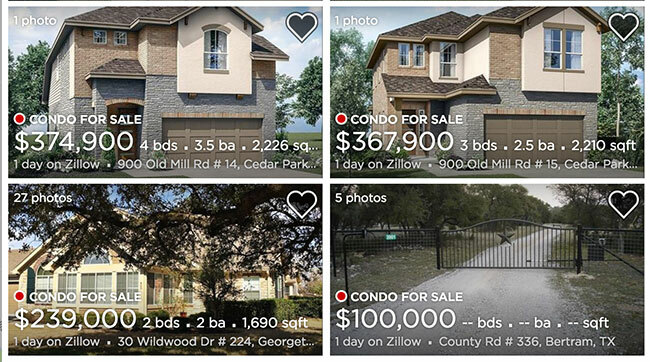 How much will it cost to move to Austin? What’s fun to do in Austin? And if you’re looking for more info on moving to Austin, check out our resources on the cost of living in Austin, Austin Neighborhoods, and our Austin move cost guide. Because of its boom in cultural relevance, Austin has the 11th highest population in the United States, clocking in at 966,860 people. As of 2018, Austin has the 19th highest rent in the courntry with the average 1 bedroom apartment costing around $1,229. And even though it became popular as an inexpensive environment for artists to create, Austin’s high cost of living has lead it to be the 23rd most expensive city in the US. 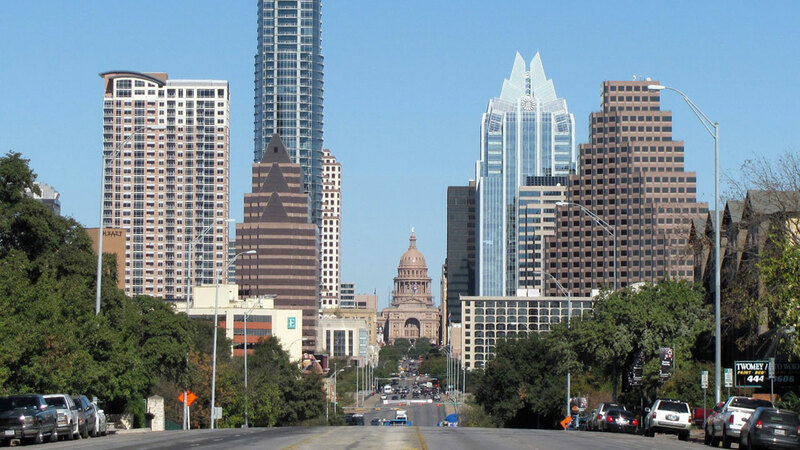 Now, before we really get into it, let’s take a tour through downtown Austin. Austin isn’t a huge city, but that doesn’t mean it doesn’t have its regional distinctions. The center of town, including the Downtown, Central, and parts of the East and West regions, are going to be both the most exciting and most expensive place to live. As you move outwards from the middle such as the North, South, and Southeast regions, things will get cheaper but it’ll become more and more difficult to find cool things to do. Essentially, your decision on where to live is going to come down to two factors: what type of people you want to live around and how much you can afford to pay for rent. 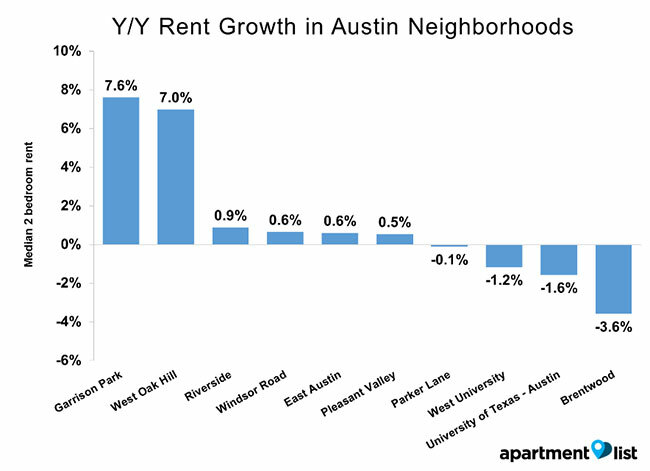 Below is a rent price heat map showing the average prices you’ll find in each area of Austin. For reference:green is less expensive and red is most expensive. Downtown, Bouldin, Triangle State, and Old West Austin are some of the most expensive, oldest, and busiest neighborhoods available with rents ranging from $1796 to $2501. Parket Lane, Wooten, Highland, and Windsor Park are all on the cheaper-end of the affordability spectrum where you’ll find rent ranging from $955 to $1074. 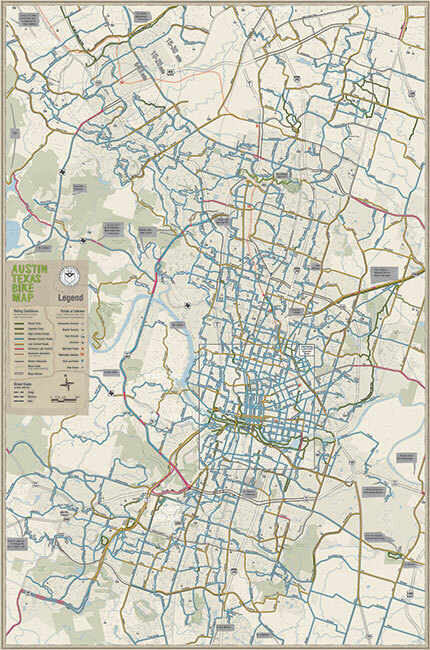 And if you still have questions, Maps of Austin is a great resource. Still, price isn’t everything. This is especially true when talking about something as important as where you’re going to live. You should also take into account the feel of the neighborhood you’re moving into. Where in Austin are people like me living? 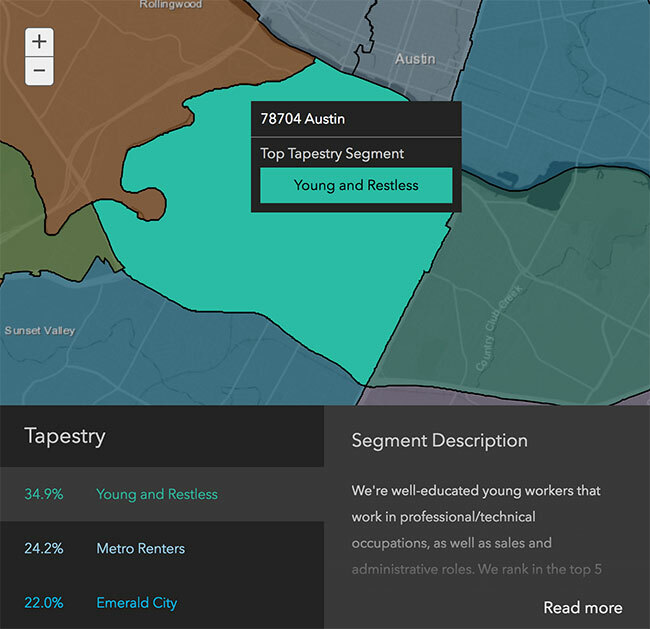 Everyone wants to live near people they relate to and Esri’s Zip Tapestry tool has made it incredibly easy to find areas with like-minded neighbors. 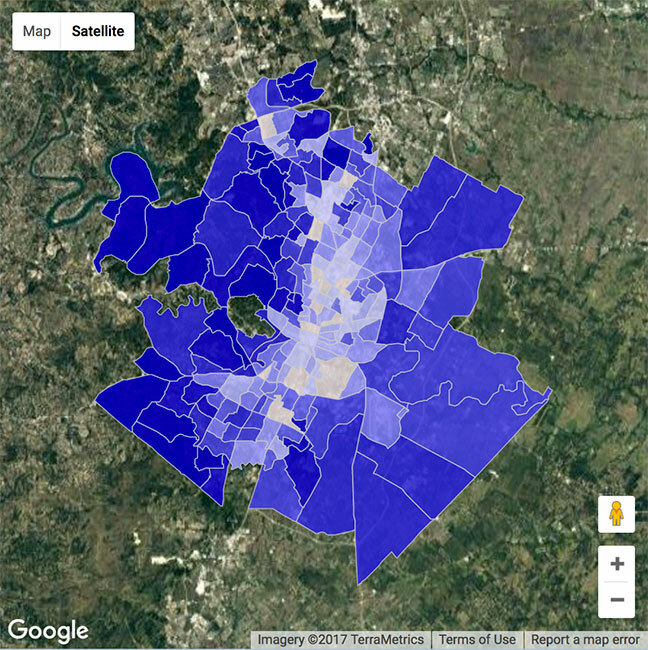 To demonstrate, when you plug in the zip code for Bouldin (78704), you get a detailed description of the three main demographic groups living in the area. Sweet! Whether you like your neighbors or not, you’ll also still need to be able to get to work on time from where you’re living. On that note, let’s take a look at the transit options in Austin. Look, everyone thinks the city they live in has the absolute worst traffic. 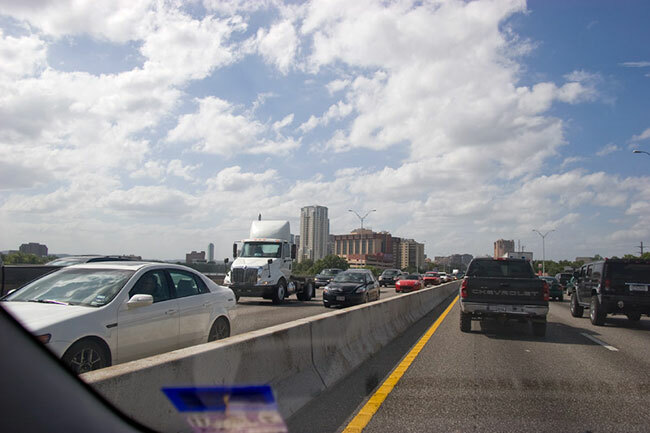 Austin has plenty of traffic, but so do most major metropolitan areas. Still, Austin isn’t without its own unique traffic quirks. I-35 gets particularly congested and is a common complaint among locals and transplants alike. Fortunately, the city recognizes this and has recently begun construction on an I-35 improvement project. In Austin, it’s also particularly important to keep an eye out for pedestrians and cyclists. This is an extremely active city and there are people jogging and pedaling everywhere. Now, let’s talk about walking. While there are some areas of Austin that are fairly walkable, the city as a whole is pretty car-dependant. A Walk Score of 39 isn’t terrible, but it definitely isn’t very good. Essentially, unless you’re living Downton or near the University of Texas at Austin, you’ll probably want to have a car. The public transportation system in Austin is…lacking, at best. With a Transit Score coming in at only 34, it’s hard to recommend this as a viable everyday option. Essentially, what this score means is that Austin has “a” transit system, but it isn’t exactly “useful” unless you’re using it strictly in the Central and Downtown regions. Alternatively, the local Metro System provides a slightly more reliable (but also more expensive) means of getting to, from, and around Downtown. Strangely enough, Austin’s best commuter option is the humble bicycle. This is probably due, in part, to the fact that Austin is an extremely active, healthy city. The community’s interest in enjoying the great outdoors has lead the city to develop a decent infastructure for cyclists earning the city a Bike Score of 52. 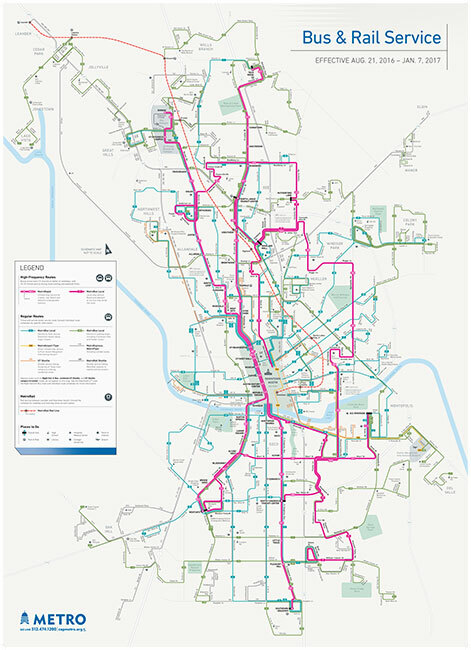 Along with their numerous bike paths (as seen on the map to the left), Austin also features B-cycle, an affordable bike-sharing program. Whether you’re considering roaming around the city on foot or on wheels, you’ll probably also want to have an idea of what the crime rate is like in Austin. It’s important to approach crime statistics in any major city with a focus on perspective. Still, when you look a bit closer at the data, you see that property damage and theft makes up the majority of annual crime, while violent crime only accounts for 8% of total crimes committed annually. So yeah, keep in mind that “crime” doesn’t mean “danger” and that as long as you stay aware of your surroundings and don’t actively look for trouble, it’s pretty easy to avoid bad situations. Still with us? Good, because now that the basics are covered it’s time to get into actually finding a place to live. 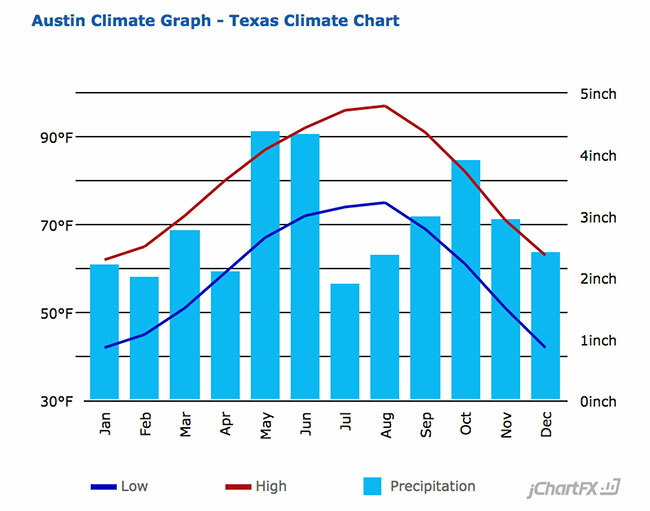 In case you haven’t caught on thus far, Austin is located in Texas and Texas, as you may or may not know, gets hot. On top of the heat, temperatures get pretty chilly during the winter too, particularly at night. Because of this, you’ll almost certainly want an apartment with heating and air-conditioning. You’ll also want to think about the price of utilities like the average internet cost in Austin, to make sure you can budget accurately. Also, the city’s poor walkability means you’ll want a place with a washer & dryer. If you’re planning on living in the Downtown area you can probably manage without. Here’s a selection of some of our go-to apartment hunting sites. Each one should have search functions that help you specify your search by the desired number of bedrooms, budget, etc. Now, it may seem a bit sketchy but Craigslist can be a really effective resource when it comes to finding places to rent in Austin, particularly if you’re seeking a bargain. 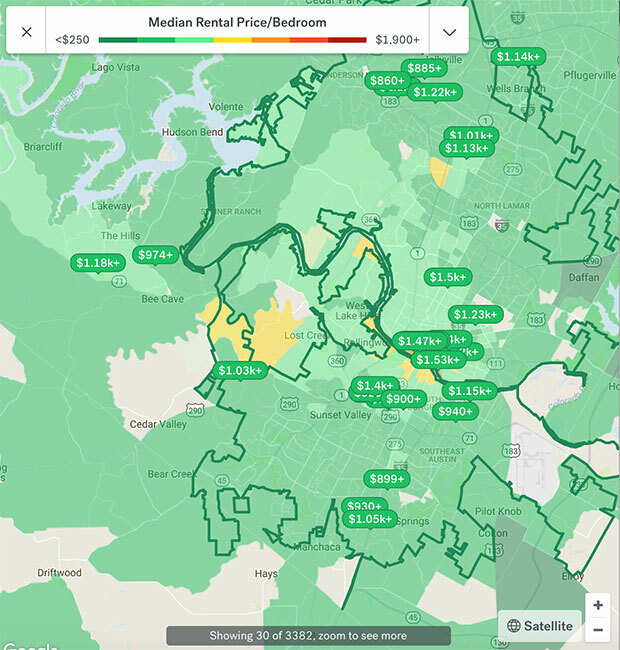 Living in Austin isn’t nearly as affordable as it once was, but in comparison to similar cities, it’s not the worst place you’ll find to rent. Between 2017 and 2018, rent in Austin has decreased by 455% which isn’t bad considering that the average rent in the US as a whole has increased by 2% in that time. Meanwhile, the vacancy rate in Austin is at 6.29% (an 0.81% increase) as of 2018, compared to the 5.85% of the national vacancy rate. So, below average, but at least it’s on the rise. There are some super sketchy landlords out there. Be sure to know your rights so you can avoid being taken advantage of. Maybe you prefer a quieter lifestyle, but also want to be close to the trademark Austin Weirdness. Fortunately, there are plenty of solid suburbs surrounding Austin that provide great spaces for families to grow without getting bored. This affordable, rural neighborhood will remind you you’re still in Texas without losing the Austin influence. The area is full of reasonably priced single-family homes, outdoor activities, and numerous local shops and restaurants. Historic Georgetown is a somewhat pricier otpion, but definitely offers more cultural attractions as well as a tight-knit community feel. With housing options ranging from single-family homes to historic Victorians and plenty of art and culture, Georgetown is the perfect “Austin adjascent” neighborhood. Now that you’ve found a place to live, you’ll probably want to know what there is to do in your area. In all likelihood, this is why you’ve moved here in the first place. Austin may have a lot going for it, but it’s biggest draw is the sheer amount of unique music, food, and bars. With a city this jam-packed, it can be hard to know where to start, so let’s get a brief overview. Like most college towns, Austin loves its booze. And with such a wide-ranging community, your options for different atmospheres in which to drink are plentiful. For those who prefer their bars a bit dive-y, Deep Eddy Cabaret is a local favorite with a neighborhood watering hole feel. For beer aficionados, can head over to Craft Pride for one of the widest selections in town- including a whopping 50 taps dedicated solely to beers brewed in Texas. And those in the mood for a night of classy cocktails should look no further than the carefully crafted concoctions at Half Step. 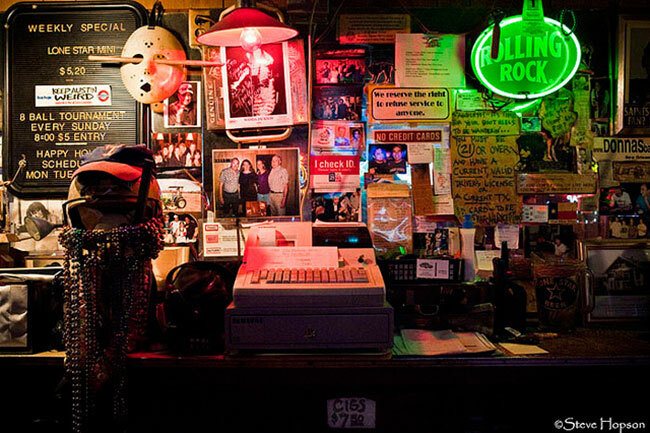 For people who prefer their bars a bit more active, Austin has a decent selection of clubs and dance halls to keep the party going until the wee hours of the morning. The intimite, hidden away Kingdom is a great spot for people who love great drinks, dancing, and DJs but don’t love huge crowds. Meanwhile, if you prefer your clubs a big bigger and louder, Barcelona is a great option for the typical “club scene”. And Rain is a classy, warehouse-like space that that attracts all kinds, but has become very popular with the gay community. Now this is what it’s all about. 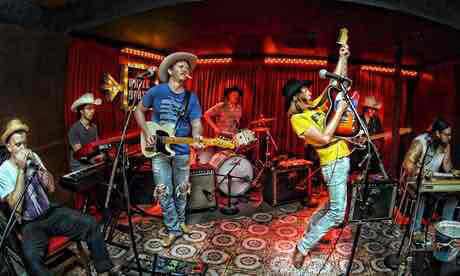 Austin is a live music fan’s paradise, but the sheer glut of options can be pretty overwhelming. Look, with a music scene this big, it’d be foolish to try to cover it all here. Everyone’s musical tastes vary so much and Austin probably covers whatever you’re into. So, here’s the city’s official resource for finding music in Athens. Use our moving cost calculator to estimate your moving costs to Austin. You’ll also want to make sure you and/or your movers have a place to park. In Texas, residents are required to apply for a temporary parking permit before parking moving vehicles on residential streets. For more information on getting a permit, check the Texas Department of Motor Vehicles site. And that’s it! Now that you’re an official Austonian, here are some of the little details you’ll need to square away. Voter Registration: Whenever moving, you should definitely get registered to vote as soon as possible. For info on registering in Texas, go here. Driver’s License: Getting your drivers’ licence changed is also very important. Here is where you find info on getting a license. Vehicle Registration: And if you’re bringing your car with you, here’s where you can get new plates. Trash & Recycling: Go here to set up the city’s trash and recycling services for your new home. Meet New People: Making connections in a new city can be pretty difficult. Fortunately, the internet makes connecting with people incredibly easy. Meetup.com has some great networks of people doing things and r/austin is a solid resource for learning about what’s going on. And once you have all the important stuff taken care of, it’s time to dive into the best of what Austin has to offer! Food: If you’re not in Austin for the music, then you’re probably here for the food. With so many restaurants popping up all the time, it can be difficult to keep track of what’s worth checking out. Eater-Austin has a pretty good tool for finding the most popular stuff right now. 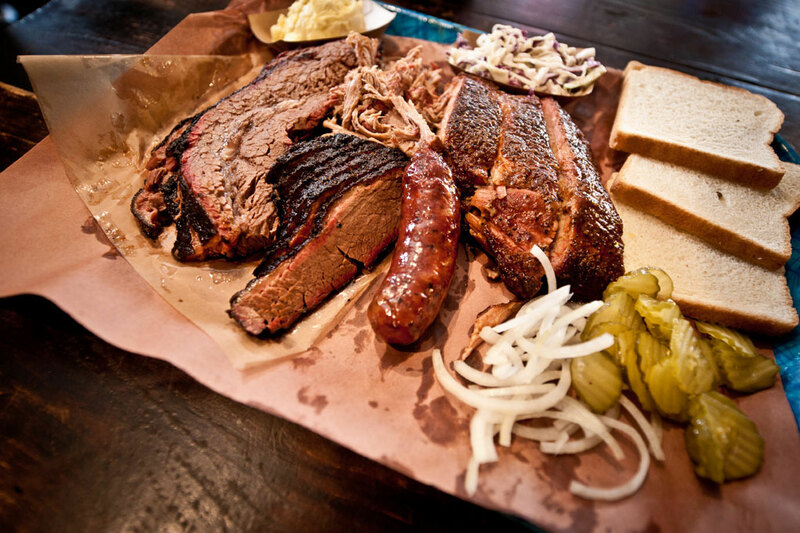 There’s also this great list of the best barbecue in Austin as decided by the area’s experts. Food Trucks: And beyond the sheer scope of great “restaurants”, Austin has a thriving food truck scene that is a world of flavors all its own including multiple parks dedicated to hosting these mobile-eateries: The Picnic, Midway Food Park, and South Austin Trailer Park & Eatery. 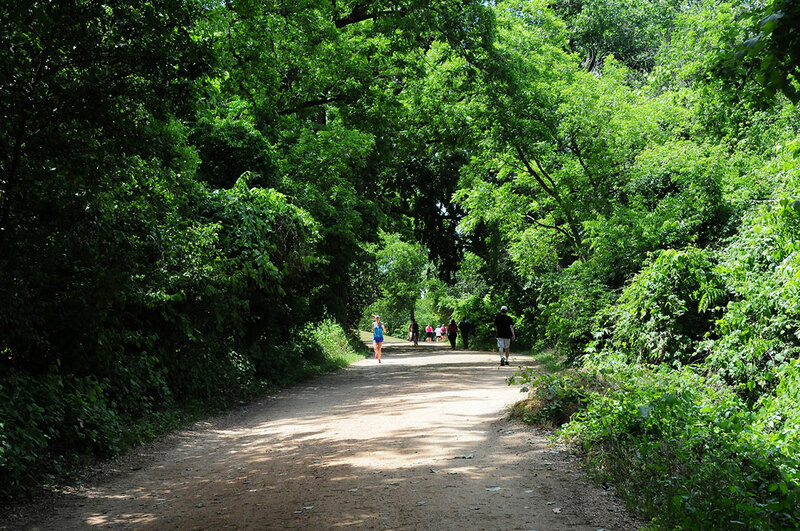 Nature: Outdoorsey types who love hiking, biking, and swimming will also find a lot to love in Austin’s great parks and swimming holes including Hamilton Pool Preserve, Zilker Park, and Barton Springs Pool, which all benefit from the great Texas weather. Festivals: The bustling music and film scene here has pretty much made Austin one of the de-facto cities for festivals in the US. Hosting massive cultural events such as South by Southwest and the Austin City Limits Festival has really put this place on the map. There are multiple festivals nearly every month, a calendar of which can be found here. Okay, that’s all. Now enjoy some music!